With three releases—Bala’s Naachiyaar, Mani Ratnam’s Chekka Chivantha Vaanam, and Radha Mohan’s Kaatrin Mozhi which fetched her acclaim from all quarters—2018 was a memorable year for Jyothika. While Chekka Chivantha Vaanam was a blockbuster, Kaatrin Mozhi yielded a decent profit to the producer. However, Naachiyaar was just an average venture at the box office. It now looks like Jyothika will have three releases in 2019 as well with each film belonging to a different genre. The actress has already finished shooting for debutant filmmaker Raj’s emotional drama, in which she plays a government school teacher who works hard for the betterment of the education standards for her students. Sean Roldan of Joker fame is composing the music for Raj’s film, which was predominantly shot on a 50 lakh set. On Sunday, Jyothika kick-started her first female-centric comedy entertainer with a traditional puja event. A Suriya’s 2D Entertainment production, the project will be directed by Kalyaan, who made Gulaebaghavali with Prabhu Deva. The yet-untitled comedy entertainer will also star veteran actress Revathy, Anandaraj, latest comedy sensation Yogi Babu, Mansoor Ali Khan, Jegan, and Rajendran in pivotal characters. The puja event saw in attendance Suriya, Tamil Film Producers Council’s Treasurer SR Prabhu and 2D Entertainments co-producer Rajsekarapandian and Revathy. Revathy was also seen playing a notorious thief in Kalyaan’s Gulaebaghavali, her role in Jyothika’s film is also said to be very crucial. As Jyothika hasn’t done a full-fledged comedy entertainer in her career, the actress is quite kicked about the project. The principal shoot of the film begins today (12 February). Vishal Chandrasekhar will be composing the music, Anandakumar will take care of the visuals and Veera Samar will join the team as production designer. After wrapping up her comedy entertainer, Jyothika will also soon start shooting for newcomer Frederick’s film, which will also be bankrolled by Suriya’s 2D Entertainment. Post her comeback, most of Jyothika’s films are being produced by Suriya, who is a pillar of support of the actress. Some of the actress’ previous films — Magalir Mattum and 36 Vayadhinile — were also funded by the actor. Fredrick is a former associate of Ahmed, who has made films like Endrendrum Punnagai and Manithan. Frederick’s film is said to be a feel-good entertainer for which the director has approached three veteran directors—Bharathiraja, Parthiepan, and Bhagyaraj. Interesting trivia is that Bhagyaraj is an associate of Bharathiraja, and Parthiepan learned filmmaking from Bhagyaraj. 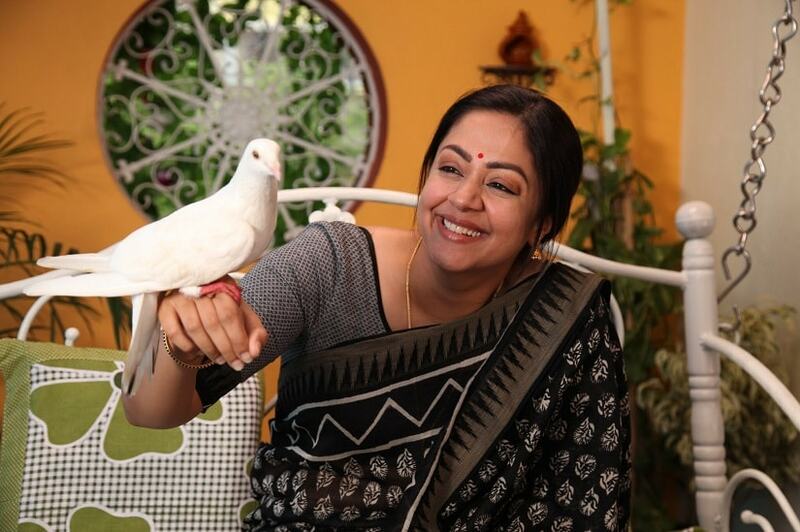 Jyotika’s first release this year would be Raj’s untitled film, produced by SR Prabhu’s Dream Warrior Pictures. The first look of the Jyothika-Raj film will be unveiled after the teaser launch of Suriya’s NGK, which has also been funded by Dream Warrior Pictures in association with Reliance Entertainment. After the theatrical release of NGK, Dream Warrior Pictures is planning to release Jyothika’s film. Followed by Raj’s film, 2D Entertainment will be releasing two of Jyothika’s movies in quick succession. The production house is also said to be in talks with director Bramma, who made Magalir Mattum with the actress, to direct a new film. Bramma was even spotted at the puja event of Jyothika-Kalyaan film on Sunday. Jyotika, Surya attend the puja event for their upcoming project.